This ticket allows general access to all three festival days of Lollapalooza Stockholm 2019 for people aged 13+ years from 28 June - 30 June. This ticket allows access to one festival day of Lollapalooza Stockholm 2019 on Friday, 28 June. This ticket allows access to one festival day of Lollapalooza Stockholm 2019 on Saturday, 29 June. 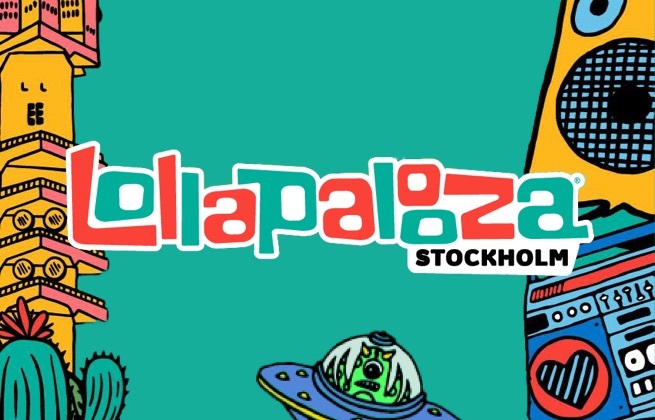 This ticket allows general access to all three festival days of Lollapalooza Stockholm 2019 for young people (aged 11 - 13 years) from 28 June - 30 June. This ticket allows general access to all three festival days of Lollapalooza Stockholm 2019 for kids (aged 0 - 10 years) from 28 June - 30 June. 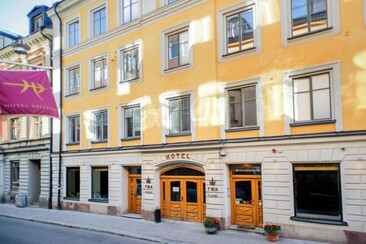 Rex Hotel is housed in a charming 19th-century building, just 2 minutes’ walk from Rådmansgatan Metro Station, only 2 metro stops from Stockholm Central Station and the Arlanda Airport Express Train. The Drottninggatan shopping street is a 5-minute walk away. The hotel offers a furnished rooftop terrace and a cozy lounge. Guests will find free tea/coffee and a free internet computer in the lobby. All rooms feature flat-screen TVs, heated bathroom floors and free WiFi. Rex Hotel’s fresh, modern rooms also have wooden floors and a phone in the bathroom. Forenom Aparthotel Stockholm Alvik is just around the corner from Alvik Station with connections via metro, tram and bus. Stockholm city centre is only a 15-minute metro ride away. The Old Town and Stockholm City Hall are about 23-minutes metro ride away from the property, and 10 minutes’ taxi ride from Stockholm-Bromma Airport. Friends Arena can be reached in 15 minutes by taxi. Forenom Aparthotel Stockholm Alvik has 182 hotel apartments, 16 floors and a view that beats most. All rooms have also a flat screen TV, electrical kettle, hairdryer, clothes iron and iron board. Laundry room and the gym is also free to use. Every room includes a kitchenette with a stove, microwave oven, refrigerator, cooking utensils and cutlery. Elite Hotel Carolina Tower is situated in Hagastaden next to Karolinska Institute in one of Stockholm's fastest growing areas. A local bus stop is found just 100 m away, while the metro station Sankt Eriksplan is 1.2 km away. Arlanda Airport can be reached in 20 minutes by taxi, or by public airport shuttle which stops right outside the hotel. A gym, sauna and relaxation area are located on the 16th floor, offering great views of the city. Each room at the hotel has air conditioning, a desk and flat-screen TV with Chromecast streaming. A laptop safe, ironing facilities and free WiFi are also included. The bathroom comes with a shower, hairdryer and toiletries. 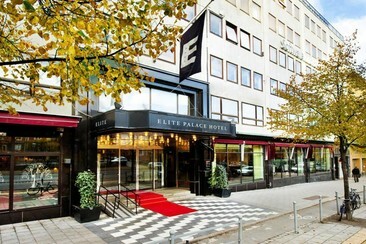 Elite Palace Hotel is a modern hotel located in downtown Stockholm. The airport bus stops just outside the hotel and the subway station is only a 5-minute walk away. The commuter train at Stockholm Odenplan connected to the subway station is just 250 meters away. If you are traveling by car, the hotel offers indoor parking. Guests can enjoy the nearness to all city attractions while still in a peaceful environment near walking paths by the water. Nearby the hotel you will find many pubs, restaurants, and cafes from all over the world. Elite Palace Hotel’s modern rooms all feature cable TV, a minibar, along with a work desk and seating area. 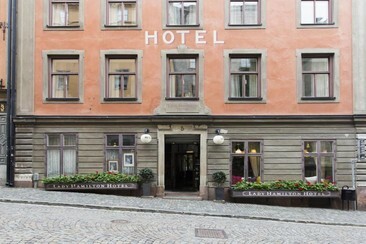 First Hotel Kungsbron is perfectly located in Stockholm Central Station and the City Terminal. This good-value hotel is just across the street from the Arlanda Airport Express Train and Stockholm Casino. It is 2 km from Stockholm Palace and 3 km from the Swedish History Museum. 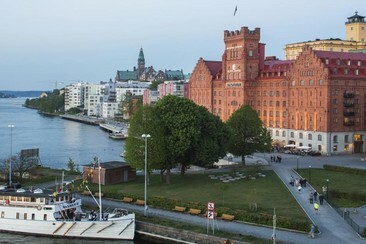 The hotel is also a 2-minute walk from Oscar Theatre and a 5-minute walk from Stockholm City Hall. Shopping, restaurants and museums are easily accessed. The hotel is stylishly decorated with handmade oak furniture. All rooms and suites, as well as the lobby, are designed in the stylish Scandinavian with exclusive wooden furniture from Gotland's GAD. Inside of the rooms are also furnished with Jensen quality beds, energy-efficient LED TV, free WiFi and the private bathroom with shower, toilet and towels. This contemporary redbrick hotel, set in a historic neighbourhood on the edge of downtown, is 1.5 km from trains at Stockholms Central station. It is also just off Drottninggatan, a major shopping street in Norrmalm, central Stockholm, and 4 minutes' walk from Rådmansgatan T-Bana Station. You're a 15-minute walk from Central Station and Kulturhuset, a cultural center exhibiting contemporary art and photography; a 20-minute walk to the Royal Swedish Opera which faces the Royal Palace across the Norrbro bridge. At the hotel, the hearty, free breakfast buffet with fresh bread makes for a great start to the morning, and the lobby bar offers drinks and snacks all day. The 62 smoke-free guestrooms are spread across two buildings and have views of either the courtyard or the quiet street, and feature quirky decor, bright colors, and free WiFi. Rooms also come with flat-screen TVs with cable channels and pay movies, as well as coffeemakers and minibars. Lord Nelson is the naval commander’s own little nest, a budget alternative that doesn’t skimp on charm or homeliness. The hotel is located on the main street of the Old Town, Stockholm, and houses an incredible collection of marine antiques. 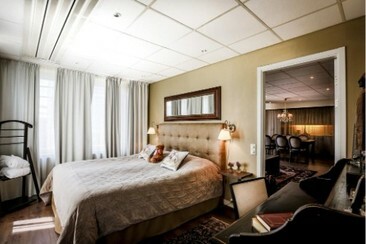 This cozy hotel is a 3-minute walk from Stockholm Palace and 2.4 km from the Nordic Museum. 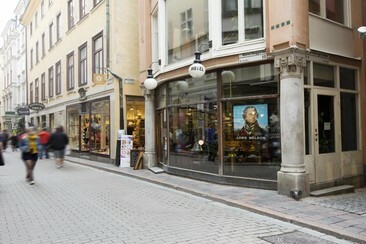 Drottninggatan, Stockholm’s main shopping street, is a 4-minute walk away. Gamla stan is also a great choice for travellers interested in old town exploring, architecture and museums. Offering hotel guests best services and a broad range of amenities, Lord Nelson Hotel is committed to ensuring that your stay is as comfortable as possible. The hotel offers access to a vast array of services, including free Wi-Fi in all rooms, 24-hour front desk, Wi-Fi in public areas, laundry service, elevator. All rooms include a tiled bathroom with a shower and hairdryer. Each room has either Hästens or Dux beds, heating and a work desk. 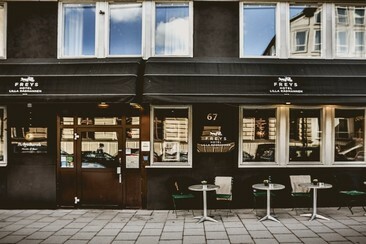 Freys Hotel is a charming family owned hotel in Stockholm, located in the heart of Stockholm near the Central Station. A perfect starting point for your stay in the capital of Sweden. The flagship hotel has 127 individually decorated rooms from cozy to contemporary. Each room has free Wi-Fi, flat-screen TVs, and minibars, plus tea and coffeemakers. Upgraded options offer desks and balconies, and a suite adds a kitchenette, living/dining space and a furnished terrace. 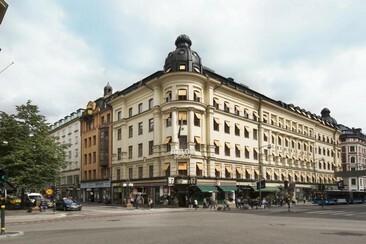 Elite Hotel Adlon is situated on Vasagatan in central Stockholm. It is housed in a charming neoclassical building dating back to 1884. Drottninggatan shopping street is just a 3-minute walk away. The Old Town with the Royal Palace is a 12-minute walk from the hotel. The Central Station, with the Arlanda Express airport train, is located 400 m away. Elite Hotel Adlon has 162 rooms, four conference rooms, and the restaurant Kött & Fiskbaren. All rooms come with flat-screen TVs with smart-TV function and cable channels, electric kettles and wooden floors. 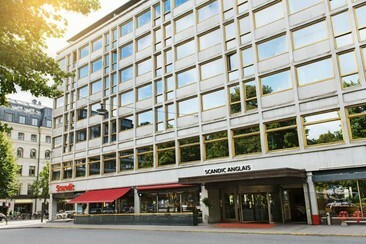 Scandic Anglais is located in Stockholm’s fashionable Östermalm neighbourhood, 1.6 km from the Royal Palace of Stockholm and 1.1 km from the Swedish History Museum. Östermalmstorg Metro Station is 300 m away, just 2 stops from Stockholm’s Old Town. 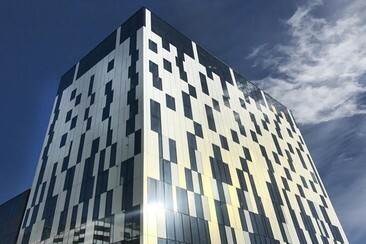 The hotel offers a stylish cocktail lounge, a seasonal rooftop bar and a vibrant lobby bar, as well as a fitness room, a hot tub and a sauna. All rooms at Scandic Anglais have a flat-screen TV with a variety of cable channels and modern décor, free Wi-Fi access, tea and coffee making facilities. Some offer balconies, minibars and fridges. Downtown Camper by Scandic is centrally located in Stockholm, just 8 minutes' walk from Stockholm Central Station. Gamla Stan, Stockholm's Old Town is just 4 minutes' walk away. Sergels Torg Square is 100 m away, while Stureplan is 700 m away from the property. Bicycles, skateboards and kayaks can be borrowed at the reception. Each room at the hotel includes a flat-screen TV, refrigerator and free WiFi. Some rooms have views of the street or atrium. The rooms are equipped with a private bathroom, which includes free toiletries and a hairdryer. Elite Hotel Stockholm Plaza is housed in an impressive 1880s building opposite Humlegården Park and the National Library of Sweden. 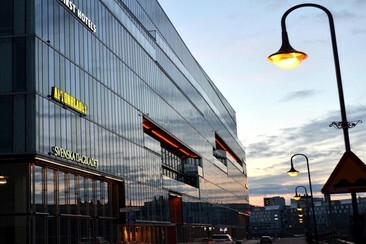 The hotel’s central location provides easy access to shopping and clubbing at trendy Stureplan. Östermalmstorg Metro Station is a 5-minute walk away. The award-winning Vassa Eggen Steak House uses top-class Swedish beef, lamb and pork. The minimalist interior design creates a Manhattan-style fine dining setting. 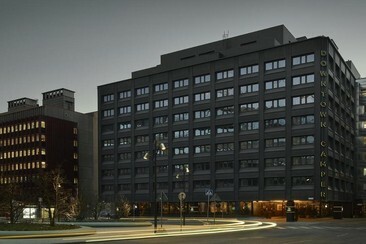 Elite Hotel Stockholm Plaza offers 143 rooms and three meeting rooms with a capacity for up to 50 people. All rooms feature colourful modern décor, cable TV, seating area and fresh bathrooms with free toiletries. 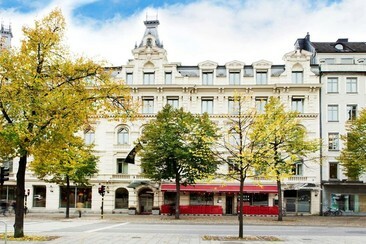 Hotel Birger Jarl is a four star set in the heart of Stockholm, in the Norrmalm district. Only 0.2 Km from the city center, the hotel's strategic location ensures that guests can quickly and easily reach many local points of interest. Also within easy reach are RFSL, Designgalleriet, Engelbrektskyrkan. Arlanda Stockholm International airport is 35 kilometres from the hotel and nearby attractions include the Sergels Torg, the Strindberg Museum, Stockholm Olympic stadium, the Royal Opera, Berzelii Park and the Kungliga Dramatiska Theatre. 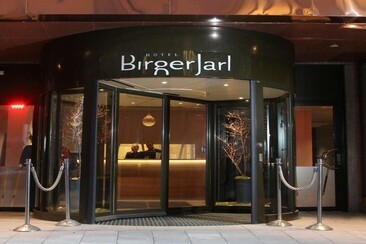 Hotel Birger Jarl is committed to ensuring that your stay is as comfortable as possible. This modern hotel services bar/lounge, fitness center, 24-hour reception, room service, onsite parking (charges apply), laundry and dry cleaning, currency exchange and multilingual staff. Room amenities include an in-room safe, ironing and sewing facilities, free wireless Internet access, TV an ensuite bathrooms with a hairdryer. Elite Hotel Marina Tower is located in right by Saltsjö Bay. Stockholm city centre is a 10-minute bus ride away. The vibrant Södermalm district is a 5-minute walk away. The nearest bus stop is within 50 m. The neighbouring Saltsjökvarn Brygga ferry terminal offers connections to Djurgården, as well as Nybrovkajen harbour in Östermalm. Guests enjoy discounted admission to the on-site Sturebadet Marina Tower Spa and fitness centre. All rooms at Elite Marina Tower Hotel feature contemporary furnishings and wooden floors. Some rooms include a small seating area and a work desk. Collector's Lady Hamilton Hotel is a personal, feminine and romantic hotel with a superb location next to the Royal Palace in Stockholm’s Old Town. Gamla Stan Metro Station is 400 m away. With the city's main attractions such as Plugged Records, Trangt and Trevligt, Stockholm Cathedral within close reach, visitors to the hotel will just love its location. Guests have free access to the on-site sauna and plunge pool. All rooms at the hotel have a minibar, cable TV and a private bathroom with environmentally-friendly toiletries. For added historic feel, most rooms feature old paintings, antique furniture and crystal chandeliers. 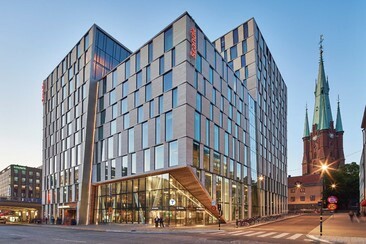 Scandic Continental is located directly across the street from Stockholm Central Station. Sergels Torg Square is less than a 5-minute walk away. Stockholm City Hall, Kungstragarden Park and the Old Town are about a 10-minute walk away. The hotel features a roof-top terrace bar with impressive city views, a sauna, a gym and 25 meeting rooms. Guests can enjoy great city views on the sun deck, located on the 11th floor. Each room at Scandic Continental offers modern furnishings, hardwood floors and a flat-screen TV with cable channels, free Wi-Fi access and bathroom with a hairdryer. 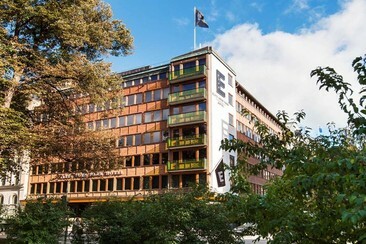 The Elite Eden Park Hotel with the location right by the greenery of Humlegården park and next door to the pulsating city life at Stureplan is the fifth Elite hotel in Stockholm. The surrounding area offers high-class shopping and trendy night clubs. Östermalmstorg Metro Station is less than a 5-minute walk away. Guests can enjoy free Wi-Fi, gym and sauna access. The 124 rooms at the hotel, designed with timeless elegance and ultimate comfort are the perfect setting for rest and relaxation after either an exhausting day at work or during a weekend off. The air-conditioned rooms feature a seating area, a minibar and a flat-screen TV with satellite channels. Some rooms include a balcony. Arrivez au festival dans le confort et à l'heure ! Ce service vous est proposé par Flixbus. Les bus sont spacieux et disposent du Wi-Fi gratuit, de snacks et boissons, de prises électriques, de toilettes et de beaucoup d'espace pour vos bagages. Attention : si le nombre de passagers est insuffisant, les départs peuvent être annulés jusqu'à 14 jours à l'avance. Get to your location from Stockholm in comfort and on time! 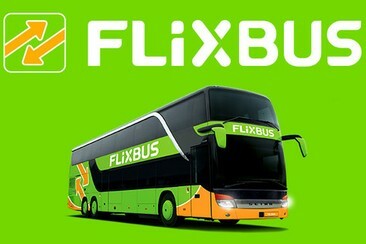 This service is provided by Flixbus. On board the bus you will find free Wi-Fi, extra legroom, low-cost snacks and drinks, numerous plug sockets, toilets and a lot of room for your baggage. Attention : si le nombre de passagers est insuffisant, les départs peuvent être annulés jusqu'à 14 jours à l'avance.